America’s antiques experts take you shopping at everyday and extra-special flea markets—you’ll see WHY collecting is fun and profitable and learn the WHEREs, WHENs and HOWs of buying and selling. Watch 19th-century European miniatures, antique trunks and irons. Bakelite plastics, nickelodeon player piano and band, STanglpottery, modern hand-turned wooden bowls, '50s transistor radios and more! 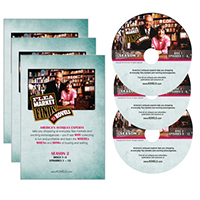 These DVDs include the second season of the HGTV series, “Flea Market Finds with the Kovels,” the TV show that will make you an expert on almost anything you see at a flea market — 3 DVDs, 12 episodes in total. Get the complete Season 2 DVDs — ONLY $24.95! These DVDs include the second season of the series. Watch 19th-century European miniatures, antique trunks and irons. Bakelite plastics, nickelodeon player piano and band, Stangl pottery, modern hand-turned wooden bowls, '50s transistor radios and more!